For $5.00 a person you get admission to the park, a cup of feed and a lidded container of nectar for the lorikeets. Children under 6 are free. From a family perspective, I like how the park is set up. You enter an arena ringed with pens. I can stand in the center and see my entire family as they run in different directions. We were advised to travel clockwise so we fed the Sicilian donkeys, then the deer, then the goats (in a cunning goat condo), then the “Hole in the Wall” gang of goats. You can’t miss the ostriches, the are gorgeous. 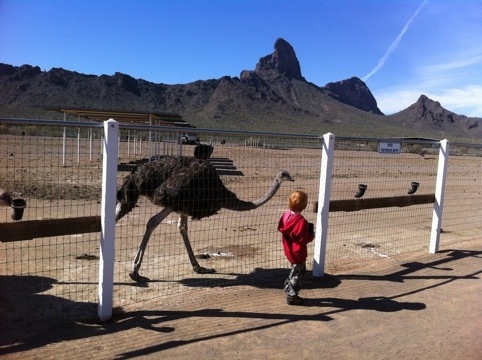 The ostrich pen is enormous. 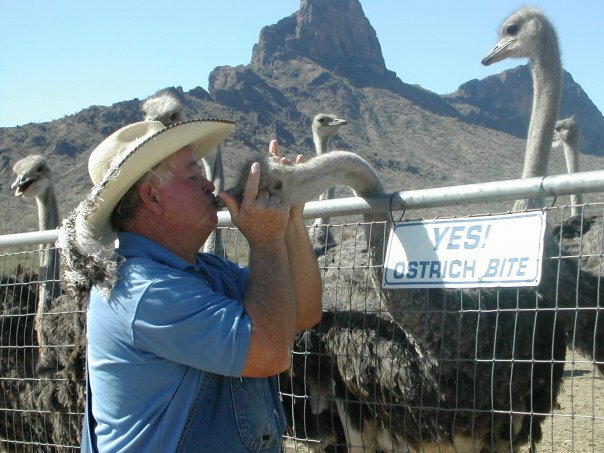 There are many signs warning “Ostriches bite” and areas for pitching food to the ostriches while keeping your fingers safe. Just past the ostriches are the ducks in a tiny enlosure and an aviary full of the beautiful rainbow-hued lorikeets. A word of warning about the lorikeets. I read the posted instructions to my boys before we entered the aviary carrying our lidded nectar. I’m glad I did. The birds are conditioned to that a guest means nectar –we were swarmed. The birds do not hurt you but it is disconcerting if you don’t expect little talons in your hair or three to five birds on your arms and hands. They will tear the lid off your nectar and help themselves. They will fight each other and squeal loudly. If you have a little one, be prepared else they will drop the nectar and cry. They will poop on you. Better to hold the nectar yourself and bear the brunt of the “love”. 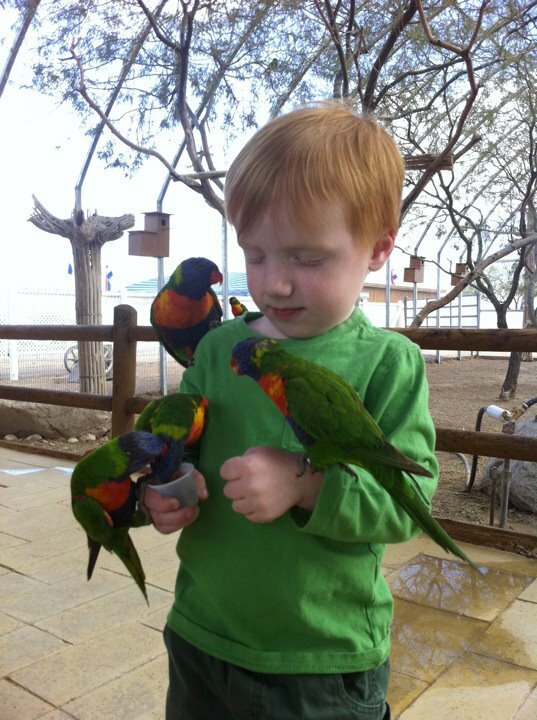 My older son did not like the lorikeets but my 4 year old adored them. Stand still, have fun, take some pictures. Take ten steps into the enclosure to mitigate the bird swarm. Our first trip into the aviary we were truly penned to the screen door by shock. (if the birds are not hungry, they won’t swarm. We came on a weekday so it was slow and the birds were aggressive). 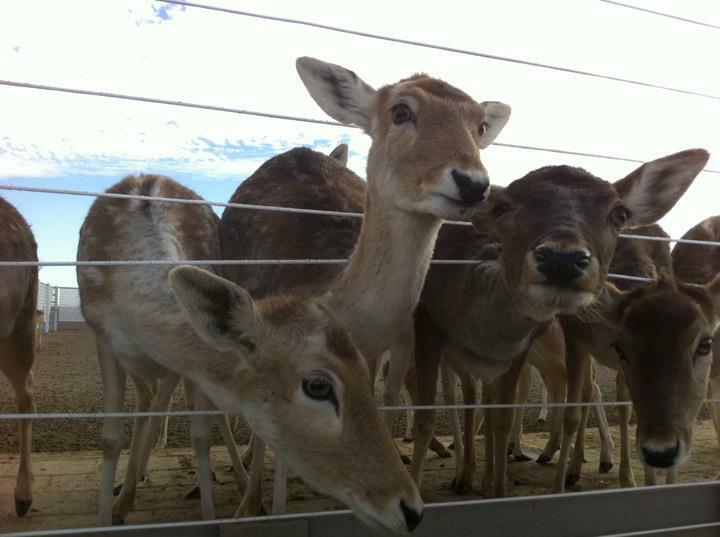 My older boy loved the deer the best and my younger boy loved the lorikeets. We plan to return to the park on a weekend and combine it with a camping trip at Picacho campground. I understand in the spring the wildflowers are beautiful at Picacho Peak. Mom Notes: Rooster Cogburn’s provides wipes in the animal area & hand sanitizer at the front counter. There is a port-a-potty in the parking lot or you can use a restroom at the Picacho Peak Travel Plaza/Shell Station (very clean) located 1 1/2 miles away under the overpass at the same exit. This exit also has a Dairy Queen (not as clean) and the Picacho Peak park to explore. If you look around when you are driving you will see all of these businesses, it is very sparsely populated and everything is clearly visible. Our out of pocket expense for this outing was $10.00 for admission and feed and then we went back for the 3 for $5.00 deal to purchase additional nectar. $15.00 and two hours of fun for myself and my two boys. Highly recommend.